Pumpkin, butternut, acorn, pattypan, zucchini, kabocha, hubbard, spaghetti—the variety of squashes is only surpassed by the number of ways you can enjoy their taste and nutritional benefits. Forget the mushy side dish you may be accustomed to eating at holiday dinners. You can make delicious sundae toppings, pancakes, muffins, breads, soups, dips, risotto, burgers, casseroles—and an incredibly easy butternut “bacon” that you’ll want to eat every day. 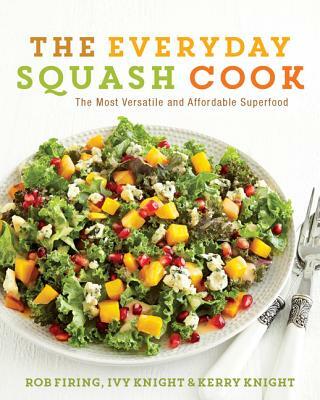 Featuring more than 100 recipes from morning to night, The Everyday Squash Cook also includes tips on handling, cutting and storing squash and a handy visual guide to the most common varieties. ROB FIRING is well known to butchers around Toronto as a steak fanatic. He has written for Publishers Weekly, the Toronto Star and various food blogs, and is the co-author of The Everyday Squash Cook, which was shortlisted for a Taste Canada Award. Rob lives in Toronto. Ivy Knight spent 10 years cooking in restaurants before leaving to work as a full-time food writer. During her career she has interviewed everyone from Anthony Bourdain to David Chang. Her writing can be found in Vice, The Globe and Mail and the Toronto Star, and she is the editor-in-chief and co-founder of SwallowDaily.com. Kerry Knight baked his first loaf of bread at age 14. He's a writer and illustrator who runs SwallowDaily.com, with his wife Ivy. He has written for The Globe and Mail and the Toronto Star.